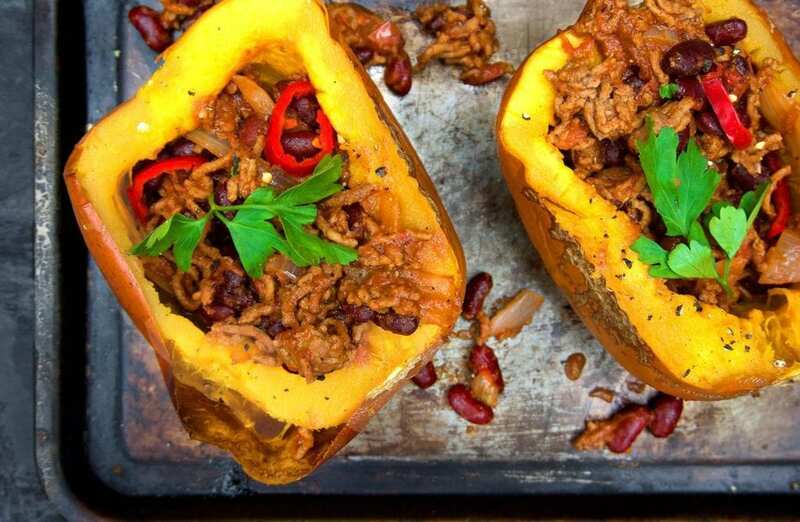 With Halloween coming up, there’s no better way to get your family eating healthy with this chilli stuffed pumpkin recipe. This recipe is incredibly easy to whip up and it certainly has that Mexican punch to it. I’ve taken an unusual twist to this recipe though and I’ve paired it with a deliciously sweet roasted pumpkin. The two actually work amazingly well together – flavour wise and like I said, it’s a great way to get the kids eating healthy too. I know in the book (chapter 1), I suggest that CARBS is an acronym for Carbs Are Really Bad Sugars, however I think it’s important to state that I was highlighting the fact that the body eventually turns all CARBS into sugar but this doesn’t mean that we should completely banish them from our diet. Yes, it’s true that we could live without consuming a single carbohydrate but avoiding them completely would mean that we would be missing out on essential fruit and vegetables which are packed full of vitamins and minerals. When reading my book, Primal Cure I hope that you understand that living Primally isn’t about total CARB abstention, but avoiding those are void of health benefits, such as the white category of CARBS which includes rice, sugar, bread, pasta and potato’s. 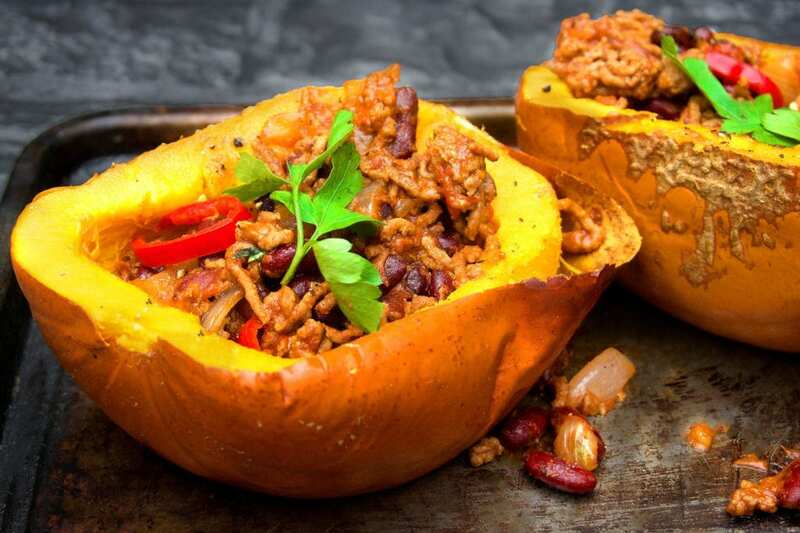 So with healthy foods, where CARBS (such as the pumpkin and kidney beans seen in this recipe) are wrapped into the package as a side macronutrient, we need to evaluate each to understand their health benefits. One of the areas that Primal Cure differs from the Paleo way of living is in our views on legumes. Firstly, there is growing evidence to suggest that our Primal ancestors did in their diverse diets, consume certain beans and other legumes such as peanuts. As a result, I don’t think it will be too long before those practitioners of strict Paleo diets, begin endorsing the bean! Whilst kidney beans do contains CARBS, they do so in a complex form and are actually a really great source of minerals, vitamins, proteins and fibre. The same goes for pumpkin, as well. Pumpkin is actually a great vegetable to get creative in the kitchen with. It’s a good source of Vitamin E (Alpha Tocopherol), Thiamin, Niacin, Vitamin B6, Folate, Iron, Magnesium and Phosphorus, and a very good source of Dietary Fiber, Vitamin A, Vitamin C, Riboflavin, Potassium, Copper and Manganese. Now, we all know that a classic chilli con carne recipe includes the popular meat, beef, which in my books is perfectly fine as long as you’re using the organic kind. Beef is an excellent source of protein as it’s also rich in omega-3. Grass fed beef however, contains a secret healing component called conjugated linoleic acid (CLA) which along with dairy products, are the riches sources of CLA we can consume. Early animal research into the benefits of CLA has been studied where it has resulted in reducing tumors by over 50% in cancers such as breast, colorectal, skin, stomach and lung. CLA is also said to help sufferers of asthma, fight off cardiovascular disease, lower blood pressure and reduce the risk of osteoporosis. When thinking about beef I like to think of one of my favourite sayings, “A couple of organic grass fed steaks each week, will reduce your odds of ending up in the local hospital A&E.” If however, you’re not a meat eater then you can simply miss the beef completely and add a few more kidney beans to the dish for some added protein! Either way, this recipe is full of Primal friendly ingredients and hopefully, will make a staple into your family meals. A delicious, Primal friendly recipe that packs a Mexican punch and will certainly be a family dinner hit. Begin by pre-heating your oven to gas mark 6. Once warm, place your pumpkins in the middle of the oven and cook for 40-60 minutes (dependant on your choice of softness). 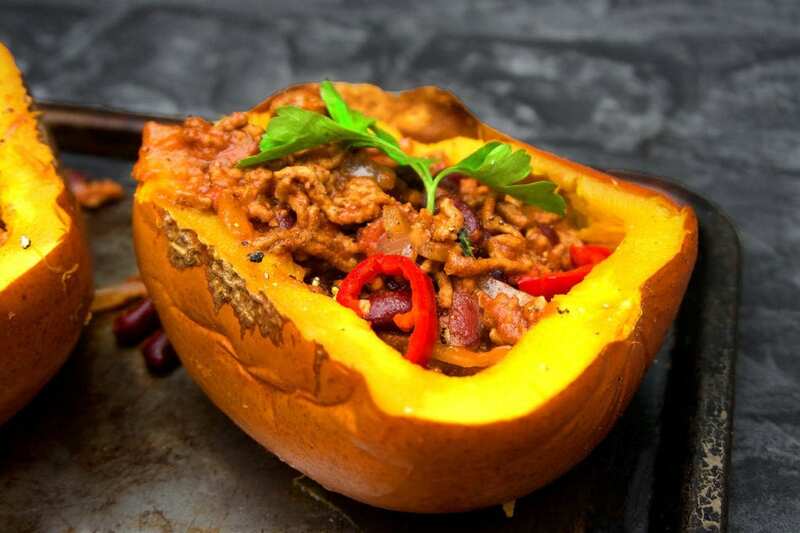 Half way through your roasting your pumpkins you can start to make your chilli. Begin by cooking your organic mince and onion in a pan on high until the mince have browned. Once cooked, add your tin of chopped tomatoes, spices and garlic and then stir altogether and bring to the boil. 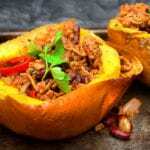 Whilst your chilli is cooking, remove your pumpkins from the oven (if cooked) and slice them in half and leave to cool. Once cool, remove the insides from the pumpkins and prepare them to be stuffed. Once boiled, bring to simmer and cook for another 15-20 minutes. Once cooked, add your drained kidney beans and cook for a further 5 minutes. 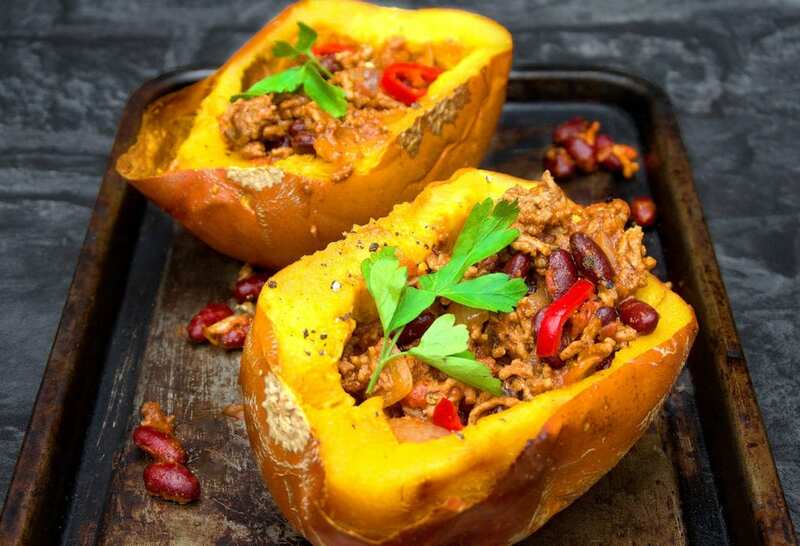 When your chilli is cooked, simply scoop a portion into 4 halves of the pumpkins. Top with some fresh parsley and serve whilst hot!